Multiple choice questions right triangle problems related to trigonometry with answers at the bottom of the page. 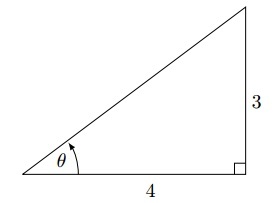 What is the measure of angle A in the right triangle below? What is the value of x in the figure below? In a right triangle, the measure of one of the angles is 49° and the hypotenuse has a length of 50 cm. Which of the following is the nearest approximation to the length, in cm, of the leg opposite to this angle? In the triangle below, what is sin α? 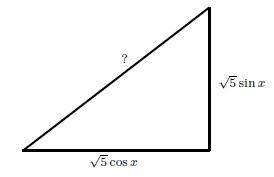 Find the length of AC in the right triangle below. Find the length of the hypotenuse in the right triangle below where x is a real number. Find the area of a square whose diagonal is 40 meters. 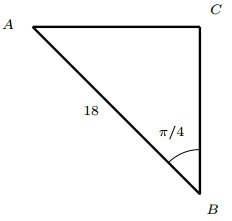 What is the length of AB in the figure below. 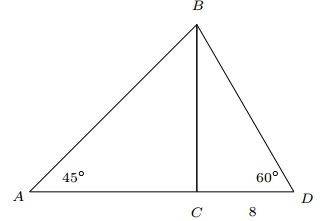 In the figure below, find cosθ. 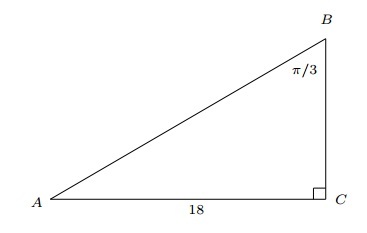 In the triangle below, m = ?